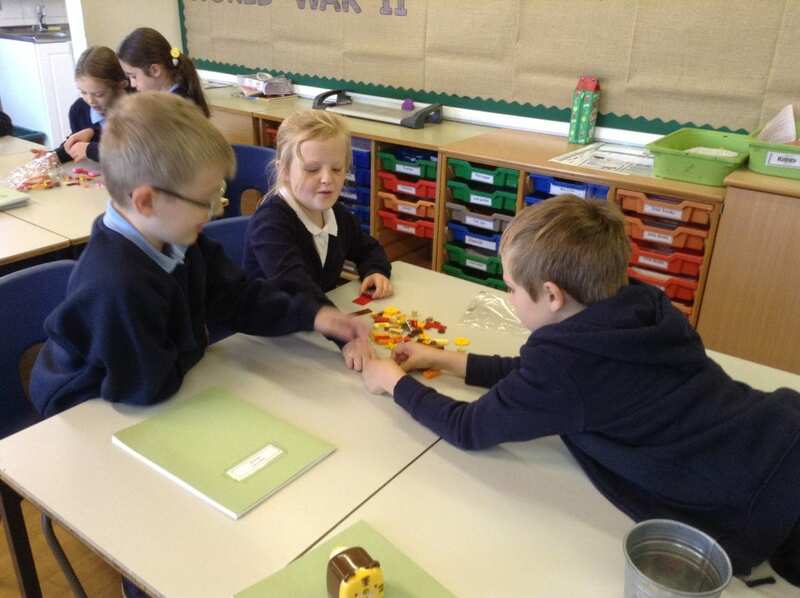 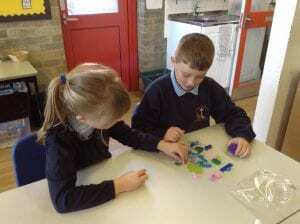 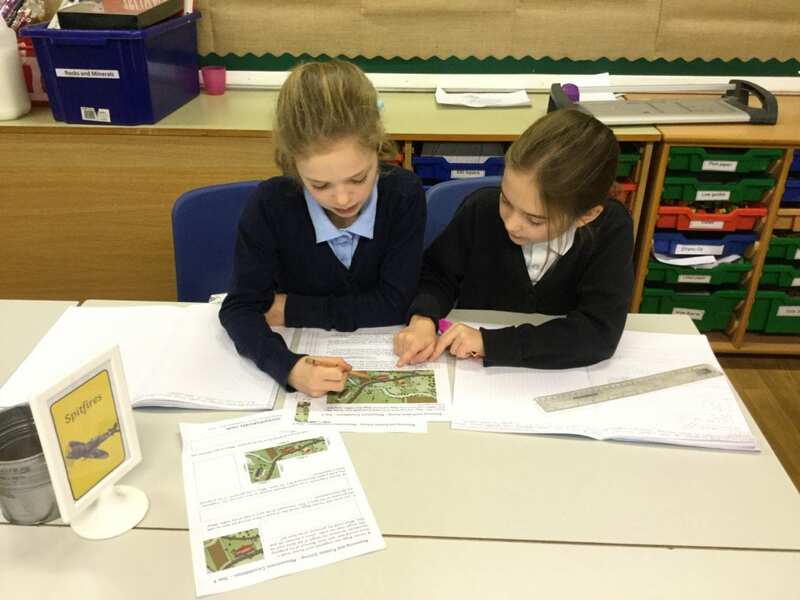 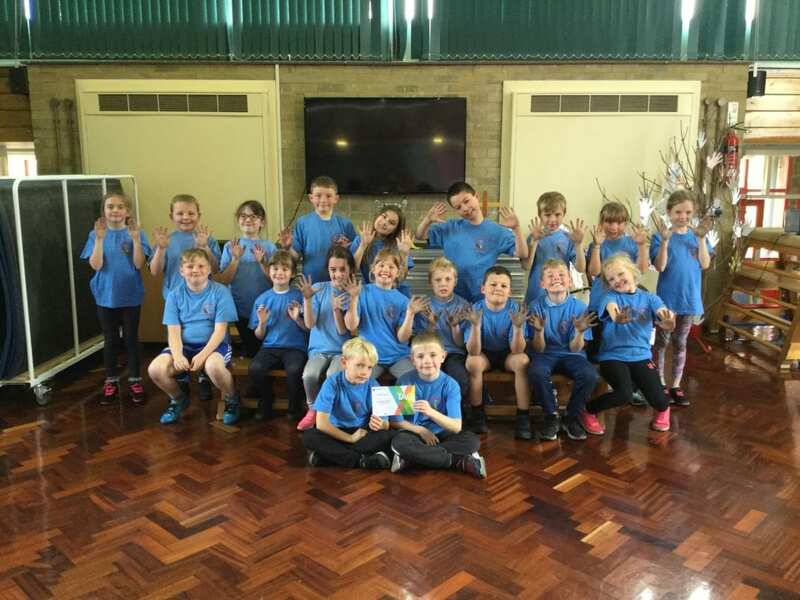 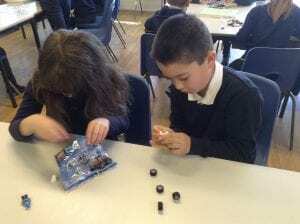 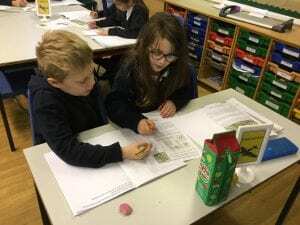 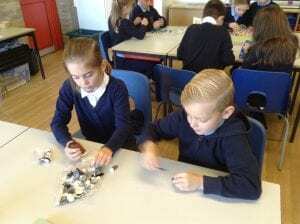 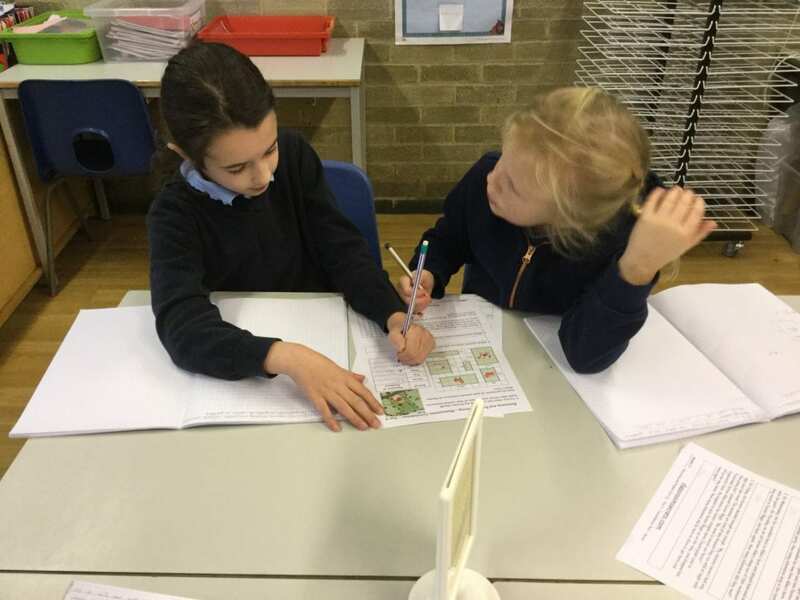 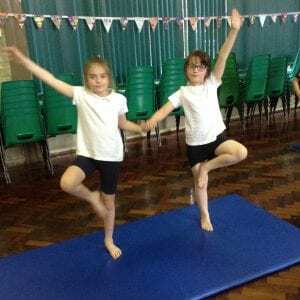 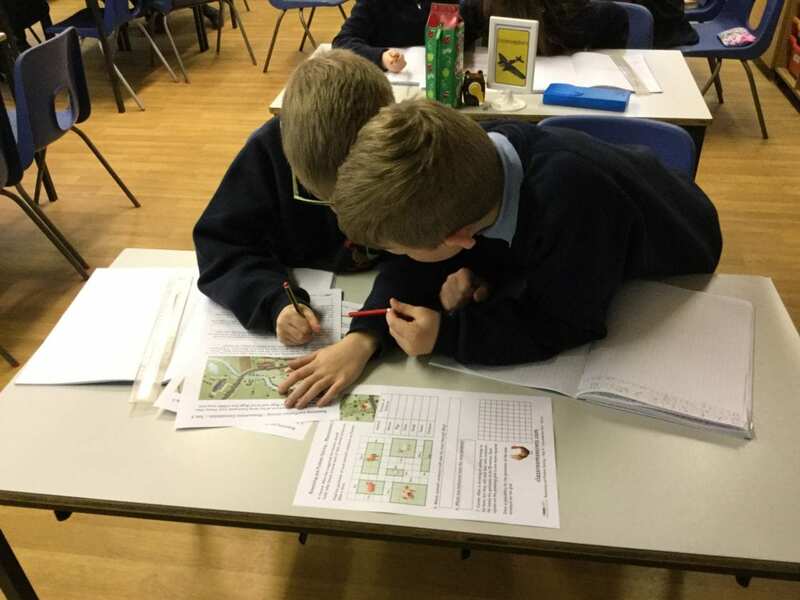 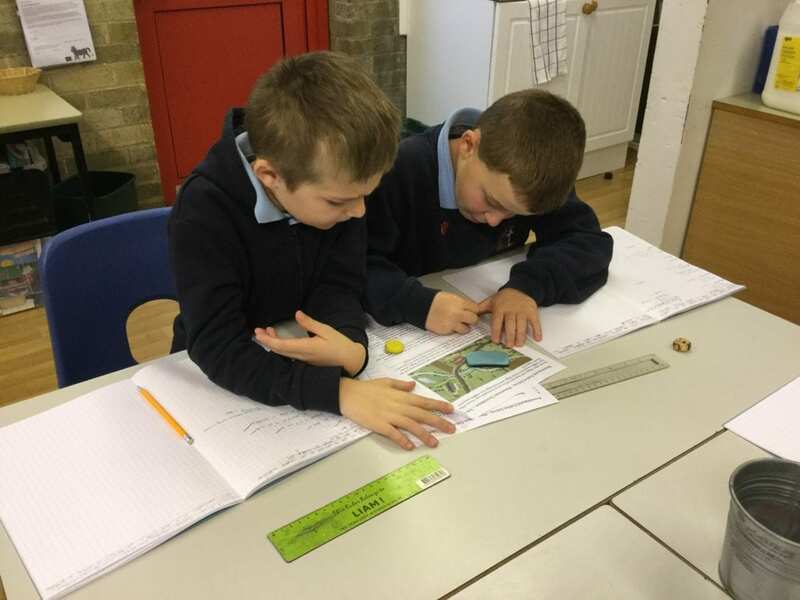 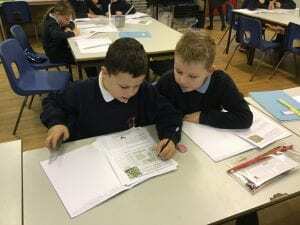 Class 4 is comprised of Year 4 children and are working at Key Stage 2 (KS2). 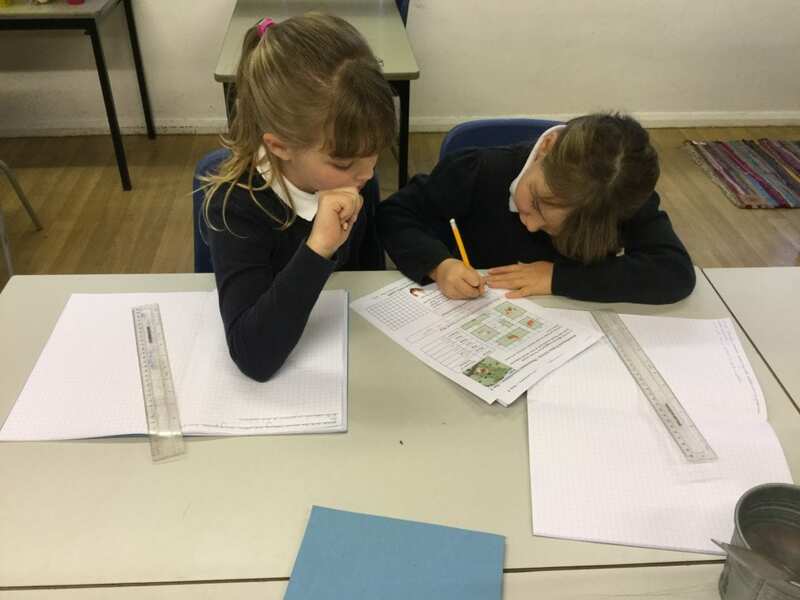 The class teacher is Miss A. Hunter-Purvis working with Mrs. A. Parvin as the classroom assistant. 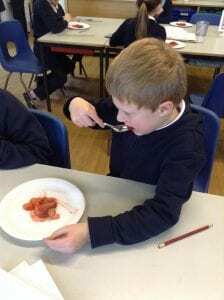 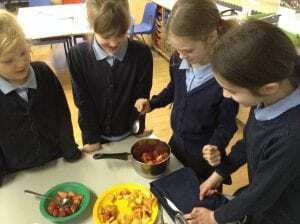 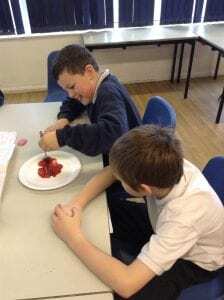 As part of our Stone Age day we made stewed fruit. 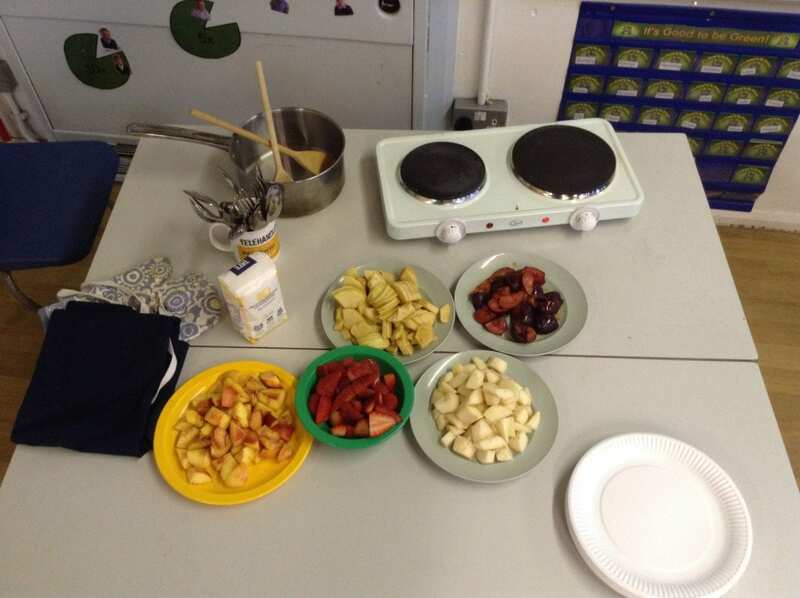 We chose our ingredients and used a hob and a pan to create a yummy treat. We all tried our fruit and most of us loved it! 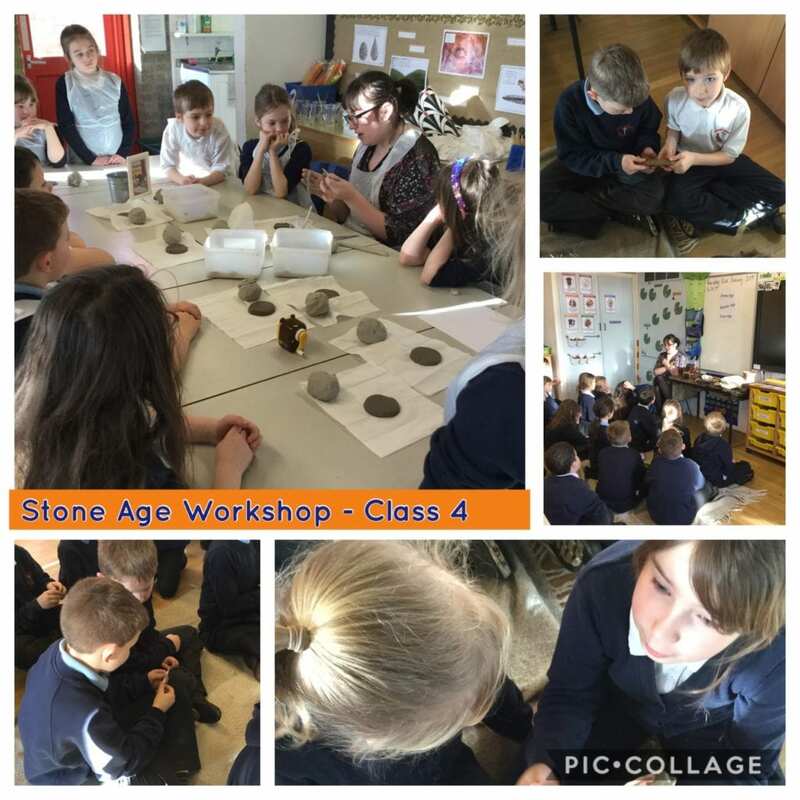 In the afternoon of Stone Age day, we were lucky enough to have Gemma from Bowes museum come and show us some artefacts and make clay beakers with us. 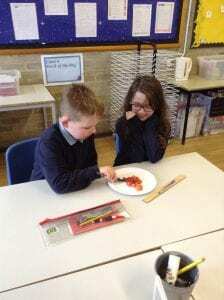 We had a fantastic time and we learnt so much about the Stone Age, Bronze Age and Iron Age. 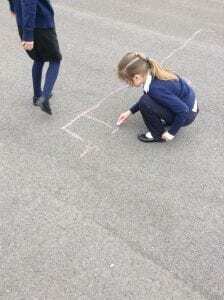 We have been looking at length and perimeter in maths. To end the week, we had to solve three farmer’s problems with their land and farms. 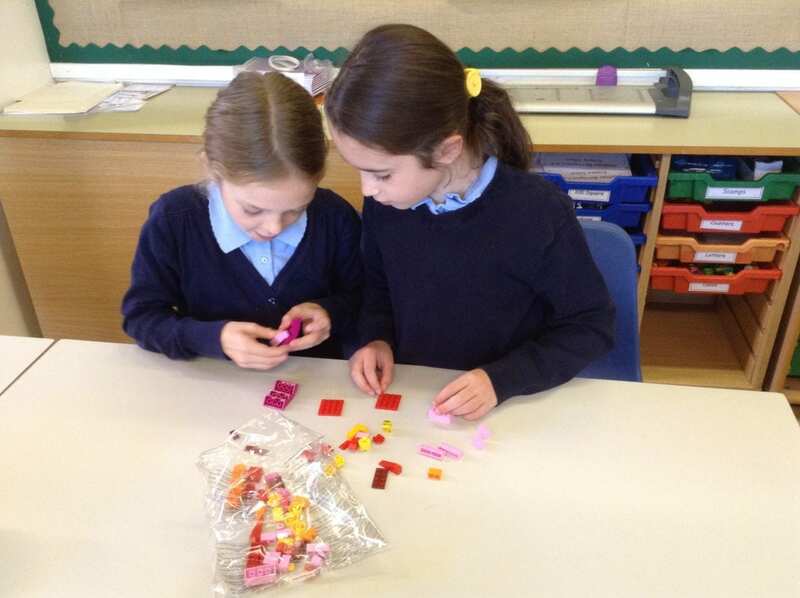 We worked in partners to solve as many problems as we could, Lily and Roxanne won the prize! 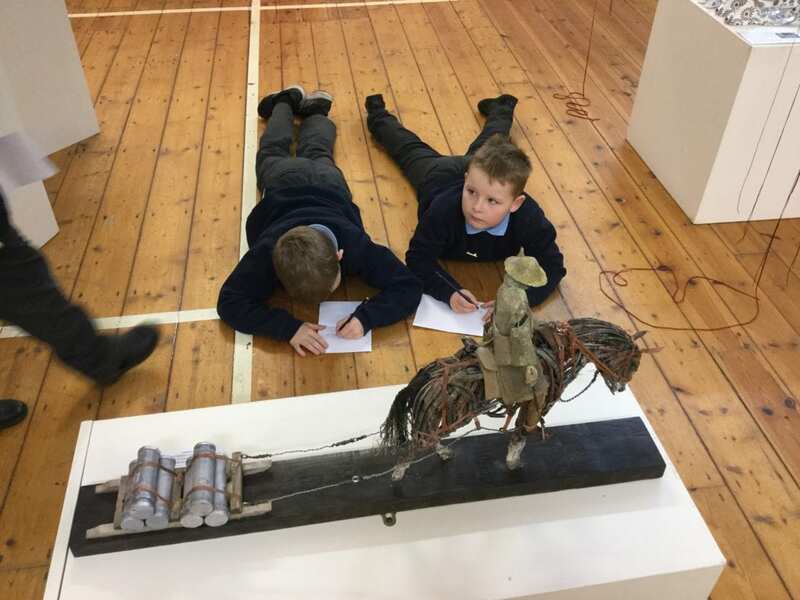 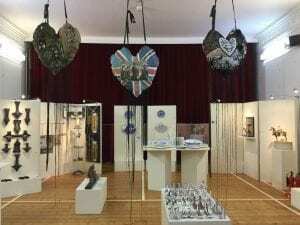 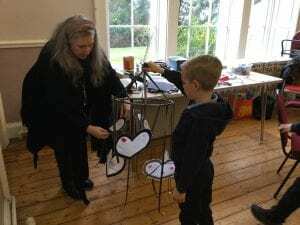 On Friday, we visited the Highlights exhibition at the church hall. 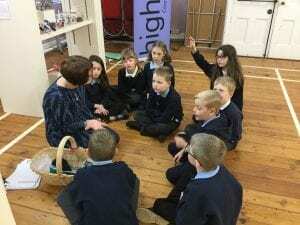 The exhibition was all about World War One. 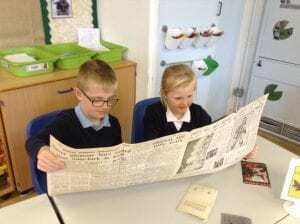 We had the opportunity to create our own art using images from WWI. 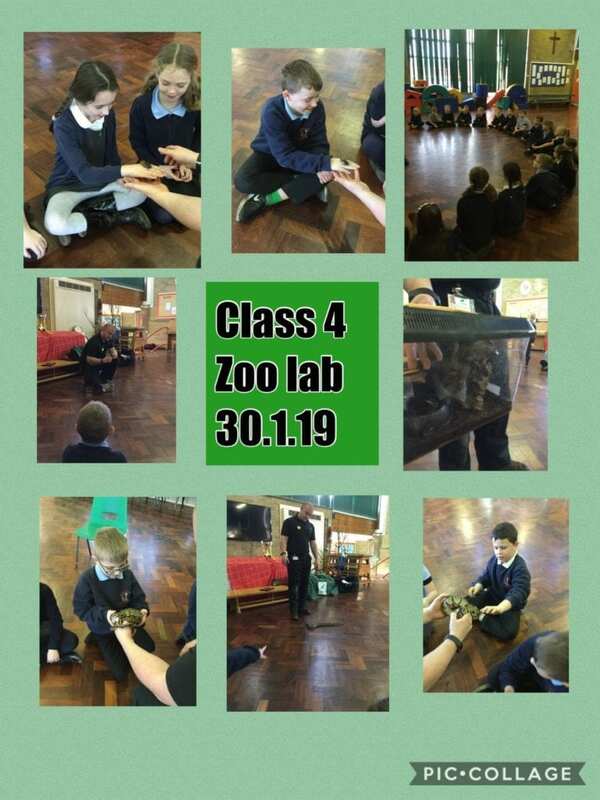 The exhibition was very interesting and we really enjoyed all of the activities. 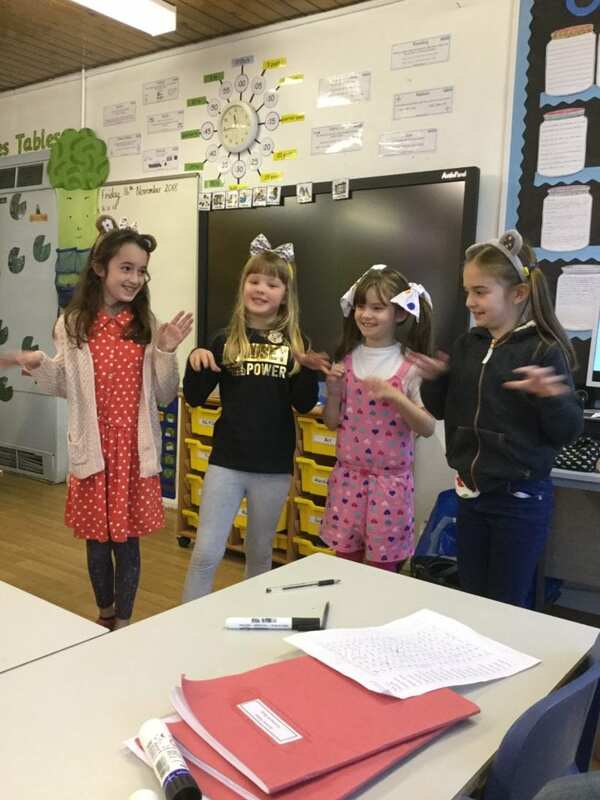 For this year’s Children in Need, we dressed in spots to raise a lot of money for disadvantaged children. 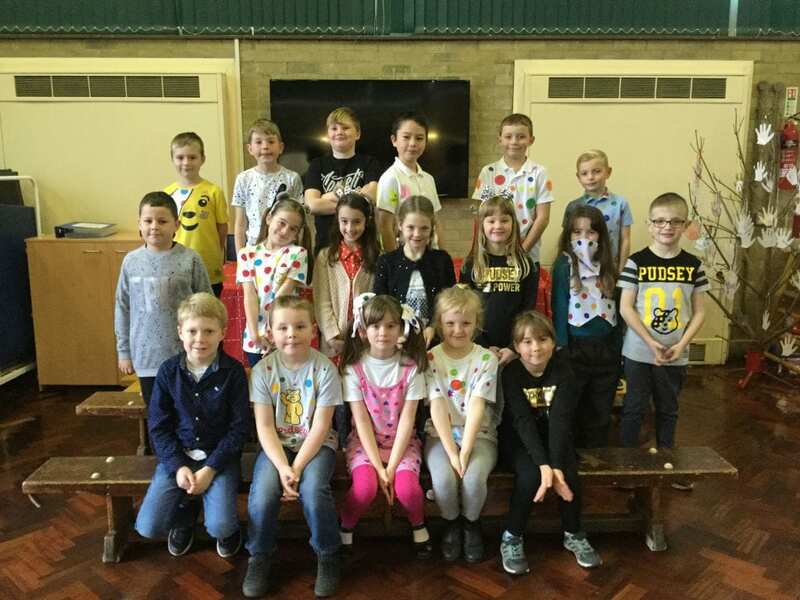 Some of us made our own spotty t-shirts and they looked great. 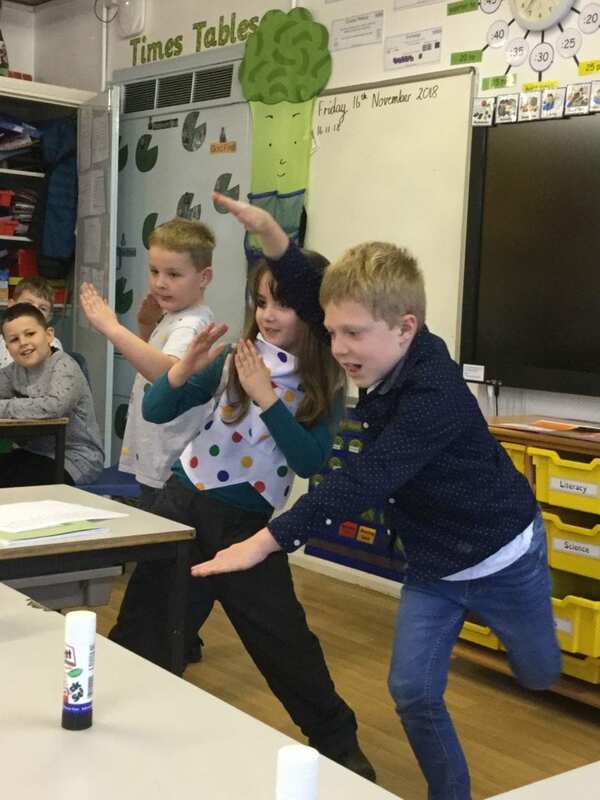 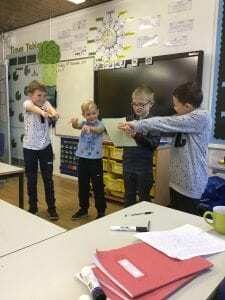 For a poetry topic in Literacy we got to perform ‘The Bug Chant’ by Tony Mitton. We acted as pink bugs, bed bugs and head bugs! 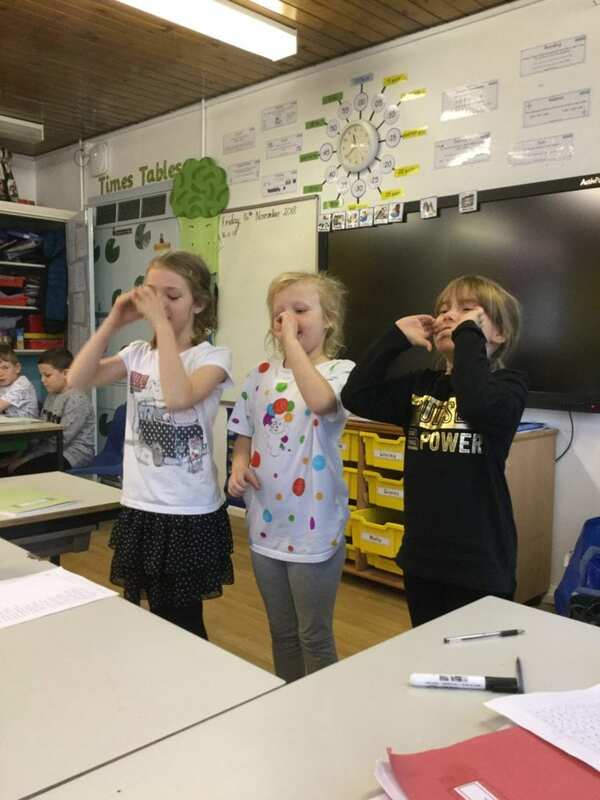 Miss Hunter-Purvis and Mrs Parvin were really impressed with the performances. 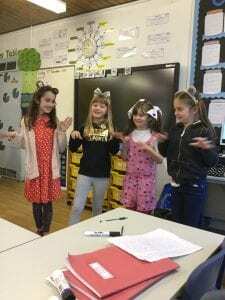 Its Halloween! 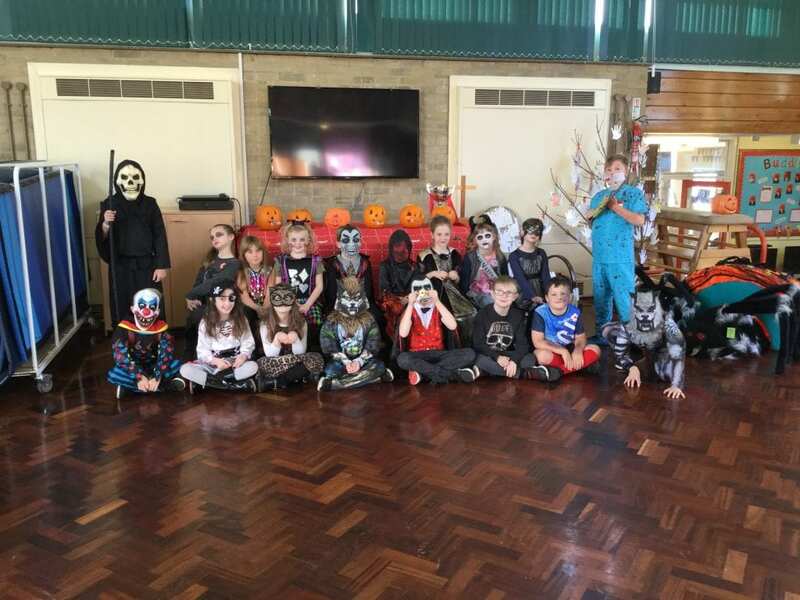 We thoroughly enjoyed dressing up as scary characters. 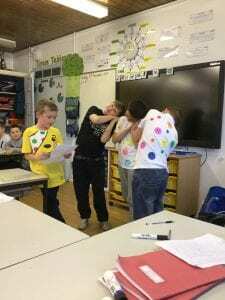 The disco was so much fun! 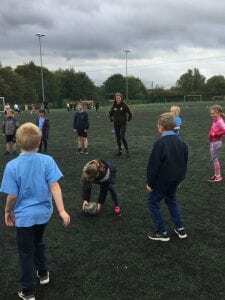 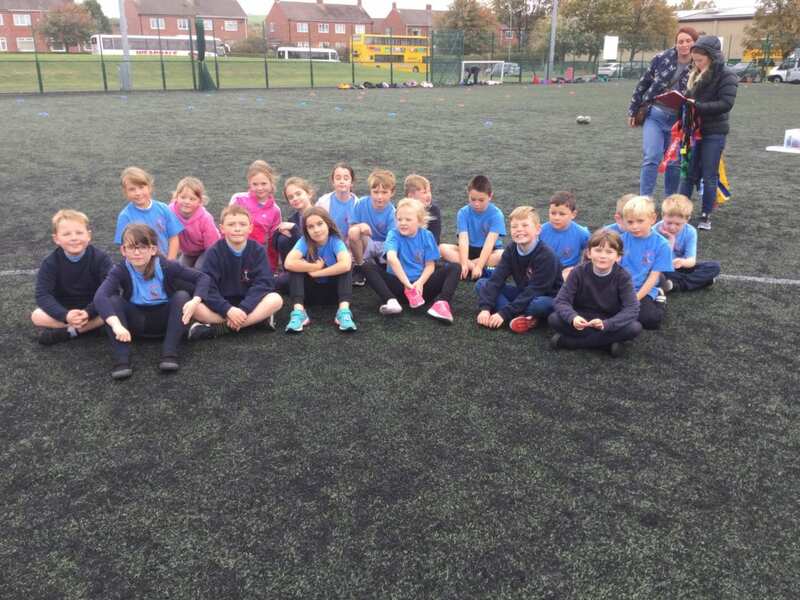 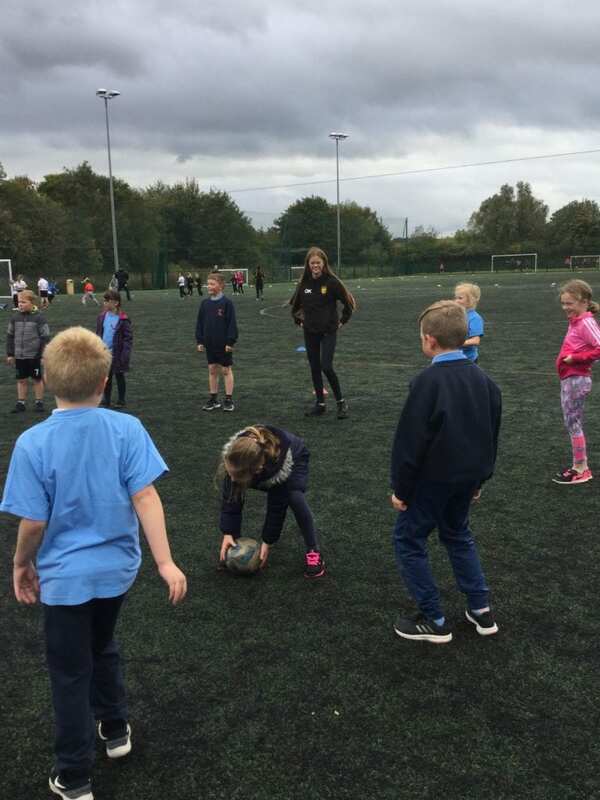 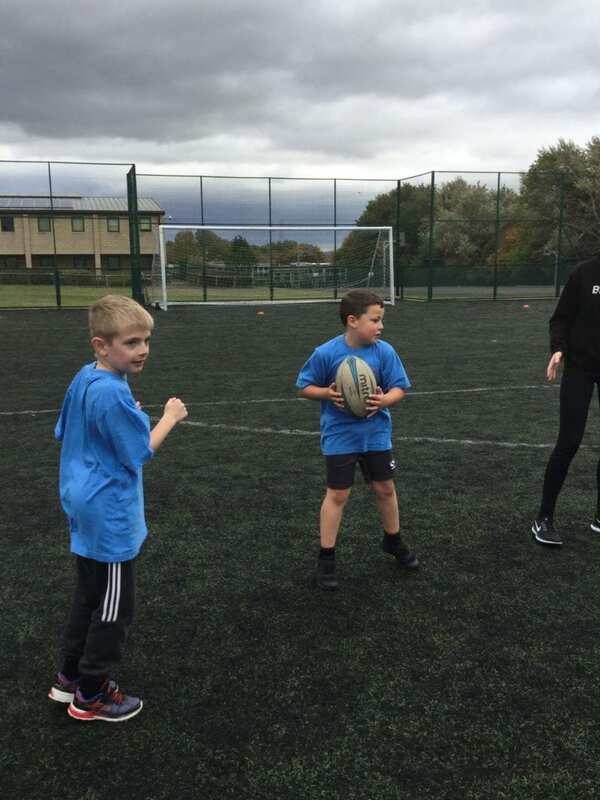 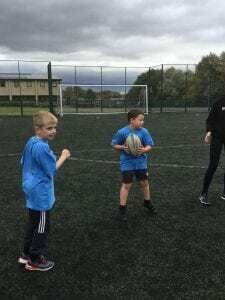 This week, Class 4 went to a Tag Rugby festival at Parkside Comprehensive school. 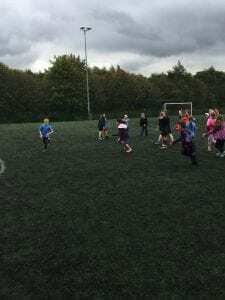 We have all come back to school loving Tag Rugby! 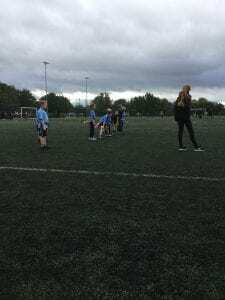 Everyone tried their best and the all-stars team managed to come second! This week in maths, we started to look at negative numbers. 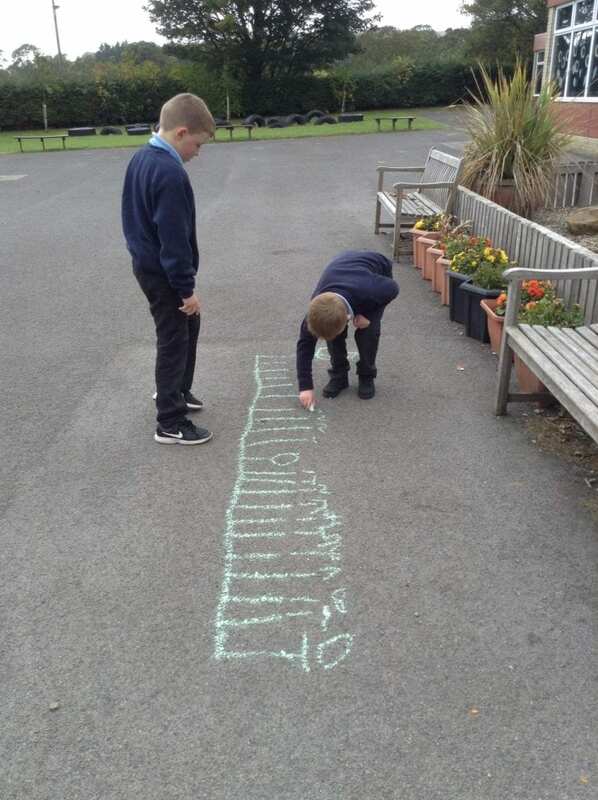 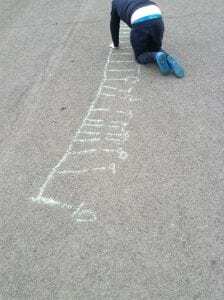 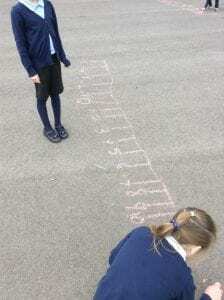 Some of us found this a bit tricky, so to help us we used chalk to draw our own number lines on the playground with negative numbers. We had a surprise guest this week in Class 4. 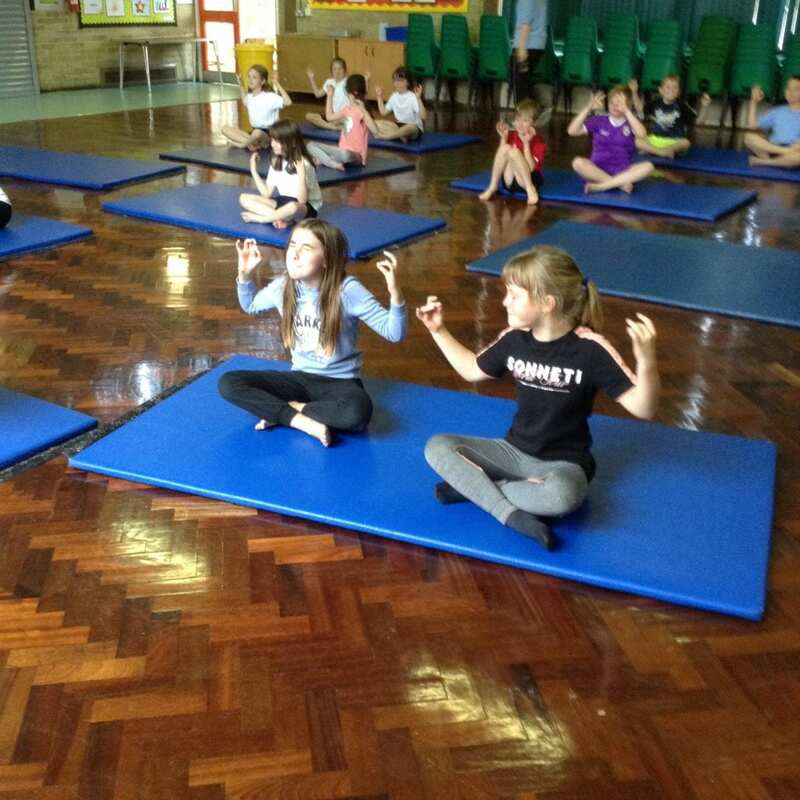 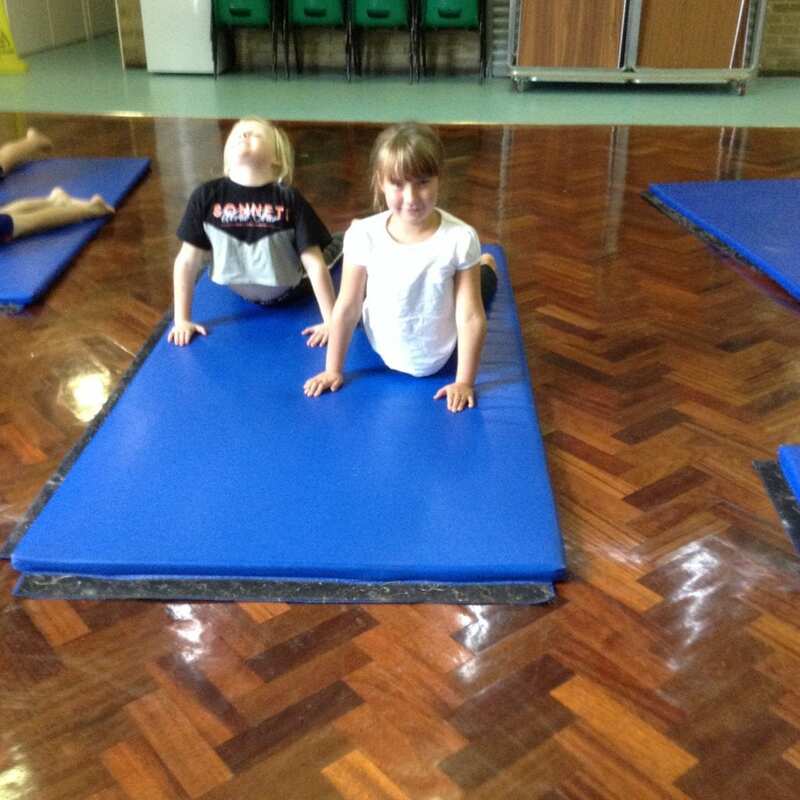 Miss Hunter-Purvis’ sister came into school and did a yoga class with us. We learnt lots of poses and had great fun! 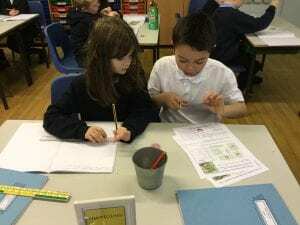 We have been looking at God as a creator in RE. We tried to create Lego models without the instructions then we tried with them. 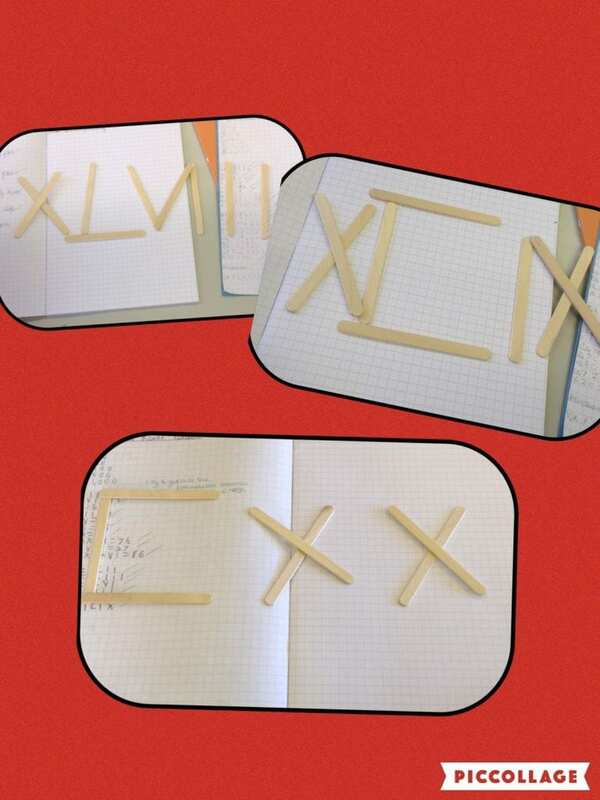 We found it much easier with the instructions! We then agreed that God had written the Ten Commandments to guide Christians through life. In history, we have started our survival topic. 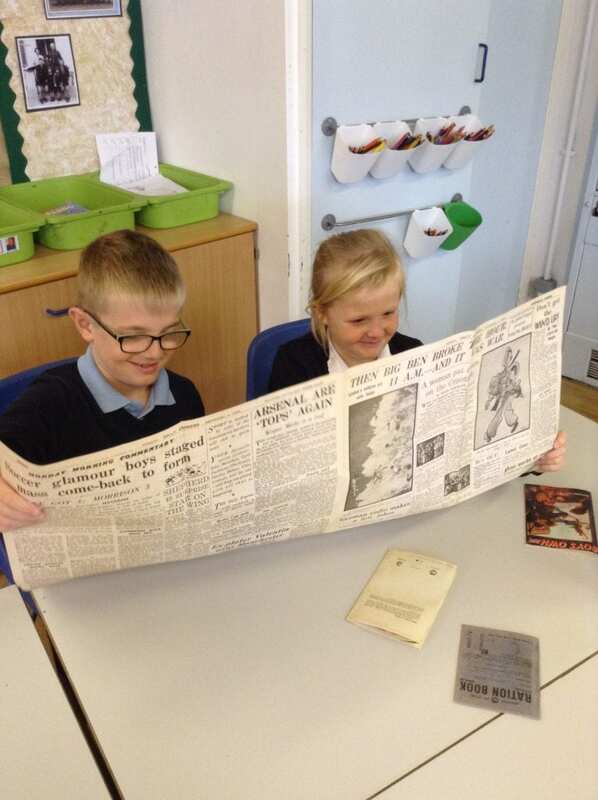 This term we are looking at World War 2 and we have had the opportunity to look at a number of replica artifacts from the 1930’s. 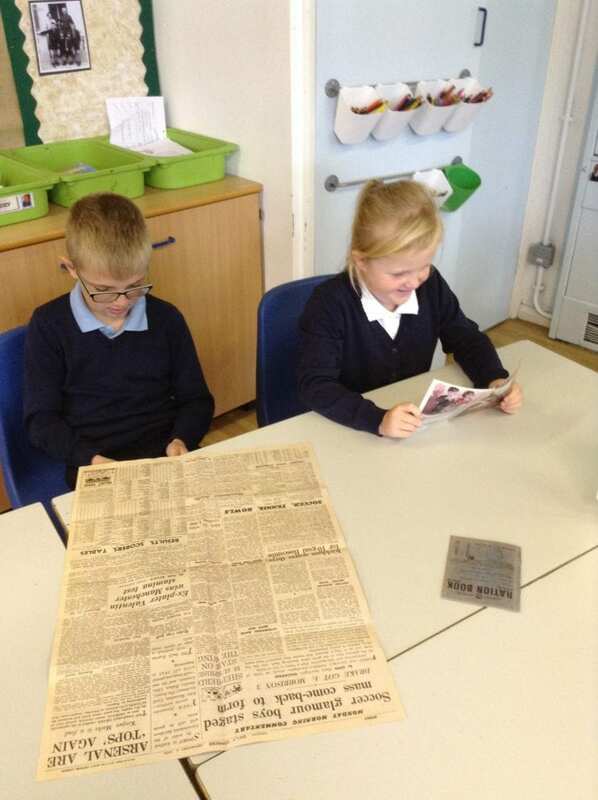 We loved looking at the newspapers and the ration books. 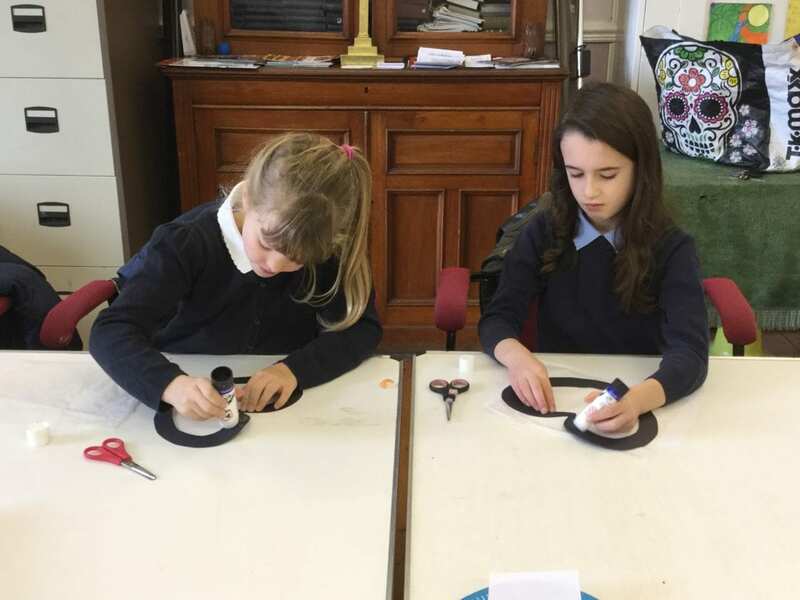 In Class 4, Lucy has been running a craft club in our golden time sessions. 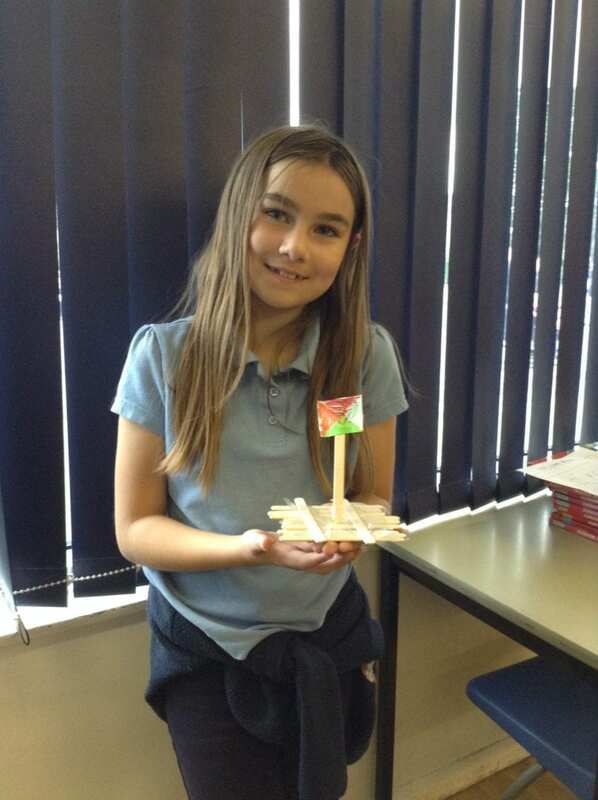 This week, she helped children to make rafts out of paper and lollipop sticks. They were excellent! 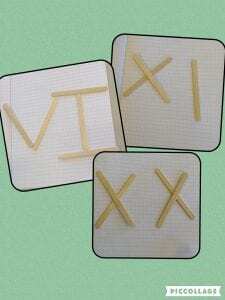 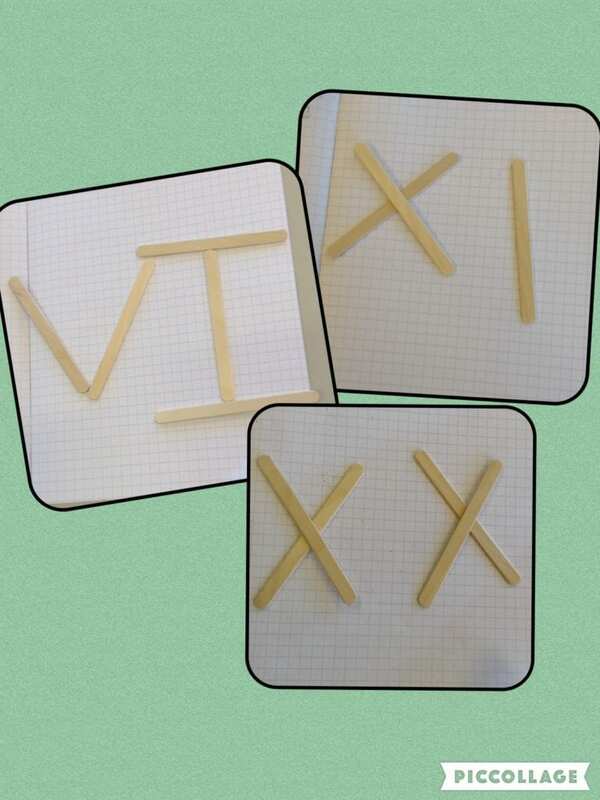 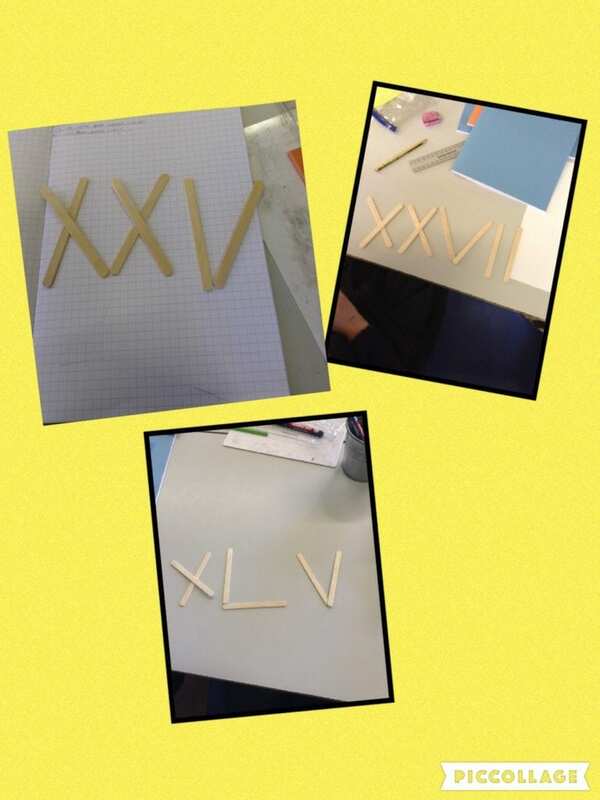 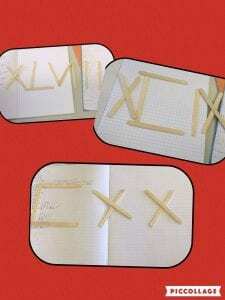 In maths, we started the term looking at Roman numerals. 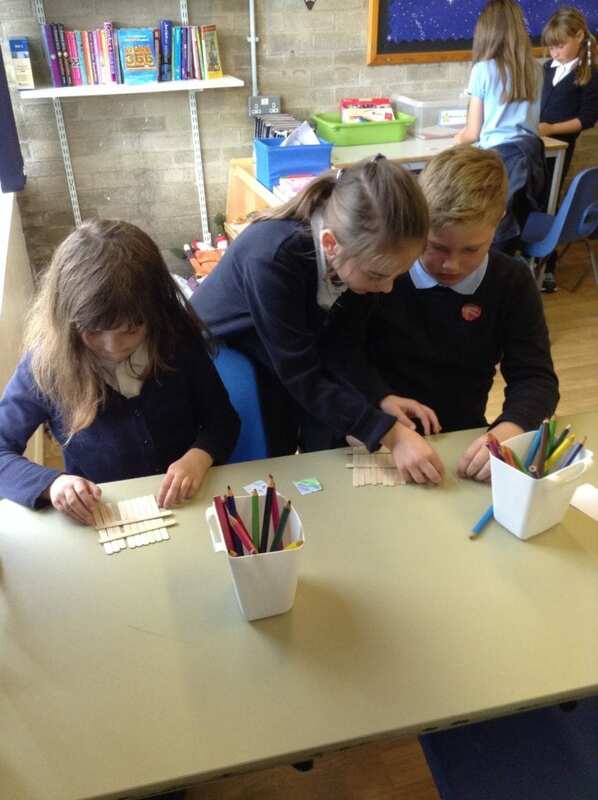 We got to test our partner’s knowledge with lollipop sticks, some of us challenged our partners with really large numbers!